SEAN: You know the drill. Last week of the month, piles and piles of titles, let’s get right to it. Dark Horse gives us a 2nd volume of Dangan Ronpa: The Animation, whose awkward subtitle lets you know it’s based on that rather than the game. And they also have a 4th Oh My Goddess omnibus, which is warring with Dragon Ball for most re-releases. This is my featured manga this week, and I guarantee it’s my pick of the week as well. 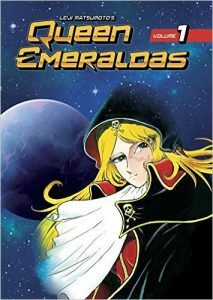 The first omnibus volume of Queen Emeraldas is coming from Kodansha Comics, and I’ve heard it looks gorgeous. Matsumoto’s manga is always amazing, and don’t let the age of the material stop you – this is top tier. ANNA: I am also very, very excited! ASH: Definitely picking this one up! SEAN: Also from Kodansha, we have a 3rd volume of Real Account. ASH: As far as manga with games of life and death go, this series actually manages to be pretty interesting. SEAN: The other Kodansha debut is Sweetness and Lightning, which runs in good! Afternoon, and apparently lives up to the sweet part of its name. It was a Crunchyroll title that Kodansha then decided to take to print. The author is much better known for BL titles, which this isn’t. MICHELLE: I’m looking forward to this, as well! ASH: A food manga featuring a single dad and his adorable kid? I’m in. SEAN: And there is a 9th volume of Yamada-kun and the Seven Witches, currently in the middle of a very dramatic arc. ASH: That it is! I just recently caught up with the series, and I’m curious to see where it goes. SEAN: Seven Seas has a 4th volume of college romance and drama Golden Time. We also have the 4th and final volume of Haven’t You Heard? I’m Sakamoto, which is ending at just about the right time, I think. ASH: I’m glad Seven Seas took a chance on this series. SEAN: Vertical has the 2nd volume of vampire thriller Devils’ Line. They also debut Immortal Hounds, a violent supernatural thriller that runs in Enterbrain’s Harta magazine. If you liked Ajin and the like, you should enjoy this. And now for Yen. Only one digital-only title this month, the 5th volume of Crimson Prince. For print, we have a 7th volume of capital-letter loving (or just English loan-word loving) Akame Ga KILL!. A manga debut based off a light novel that comes out next month, The Asterisk War is a fantasy series with magic and swords, much like every other series licensed in the past 3 years or so. Its manga runs in… groan… Comic Alive. Speaking of manga that make me groan, BTOOOM! is somehow at 14 volumes, and more are coming. 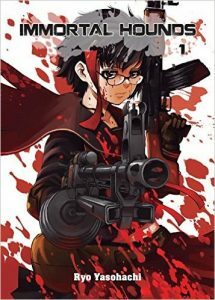 SEAN: A Certain Magical Index has its 6th manga volume. It’s adapting Accelerator and Last Order, should be good. And The Devil Is A Part-Timer! also has its 6th manga, which is only up to the 3rd book, because it’s not jettisoning some novels the way Index did. The final volume of Final Fantasy Type-0 Side Story, Volume 5, means I can stop making lame soccer-based jokes. Fruits Basket gets a 3rd Collectors’ Edition, which will collect the 5th and 6th volumes. It will feature a very awkward but true discussion of how school bullying really works in Japan. MICHELLE: And Shigure looks fetching on the cover. ANNA: More Fruits Basket is always a good thing! SEAN: Horimiya has a 4th volume of romantic sweetness – will things finally get taken further? ASH: I really need to catch up on this series! The first volume was delightful. SEAN: How to Raise a Boring Girlfriend reaches Vol. 3, and the boring girlfriend is still the major issue with this. Kagerou Daze has a 6th manga volume, and I’ve honestly lost track of which LN volume it’s adapting. And a 5th omnibus of Karneval comes next week as well. 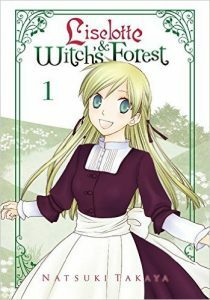 The debut I’d be most excited about were it not for Queen Emeraldas is Liselotte & Witch’s Forest, the current series (though I think it’s on hiatus for health reasons) by Natsuki Takaya, creator of Fruits Basket. It runs, when active, in Hana to Yume. MICHELLE: And a third debut I’m eagerly anticipating. All of these fab new series almost salve the pain of what we lost when various companies folded in recent years. I’ll never stop pining for Silver Diamond, though. ANNA: Ah, I’m looking forward to this, although series on hiatus always make me nervous. Also, if Michelle is going to shout out Silver Diamond, I am going to take a moment of silence for Demon Sacred. MICHELLE: I still haven’t given up hope! SEAN: Log Horizon’s harem-influenced spinoff The West Wind Brigade has a 3rd volume. And there’s a 4th omnibus of hard-to-read but fascinating Prison School. SEAN: And for those who wished Jeanne D’Arc’s life was just as tragic but had more magical girls, there’s the 3rd Puella Magi Tart Magica manga. Re: Zero had its novel debut last week, so look to that post for a description. Here’s Vol. 1 of the manga, which runs in Big Gangan. Lastly, there is a 3rd Taboo Tattoo, one of manga recent series that have an anime running at the same time. Exhausted yet? That’s a whole lotta spicy manga. You’ll need alka-seltzer.